(LoC) - On December 4, 1619, thirty-eight Englishmen left their ship, ventured into the Virginia wilderness, and observed a prayer of Thanksgiving for safe passage to the New World. Soon, the party, including a sawyer, a cooper, a shoemaker, a gun maker, and a cook, set about constructing a storehouse and an assembly hall for the plantation known as the Berkeley Hundred. 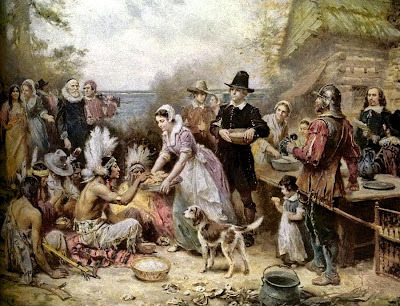 Thereafter, December 4 was a day of Thanksgiving at Berkeley, "yearly and perpetually kept holy" as the plantation charter directed.